Jesuit Academy and the Boys & Girls Clubs of the Midlands teamed together to improve and share Camp Nakomis in Carter Lake, Iowa. The Jesuit Academy did the fundraising while the Boys & Girls Clubs of the Midlands offered the land for the project. The Boys & Girls Clubs host summer camps at Camp Nakomis, which spans 35 wooded acres along the lake. Boys & Girls Clubs across the metro area serve about 5,900 children each year. The new facility will be used for the Jesuit Academy in the summer during the school’s required July academic term. They spend mornings in the classroom and afternoons at camp activities. Previously, the 65-student school had an arrangement with a camp 40 minutes away; that trip is now only seven minutes. Improvements at the camp feature a 6,000 sq. ft. building with five classrooms and activity space, a new sports field, and a 30 ft. by 50 ft. multi-depth outdoor pool. 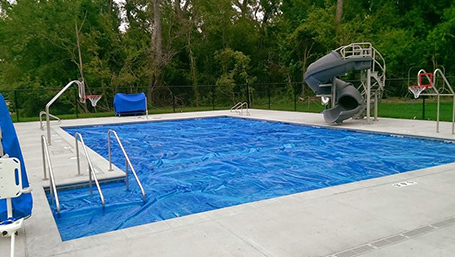 Swimming pool features include four lap lanes, two basketball hoops, a volleyball net, and a waterslide.